The best way I could describe it is that it felt like we were watching a live performance. The audience was so engaged in the film that the atmosphere in the cinema was alive in a way I haven’t felt in a long, long time. This was not your normal cinema experience where the audience sits there slack-jawed, eyes glazed over munching their popcorn while scene after scene floats on by until the end credits when everyone files out in silence. This was like watching a goddamn play. There was this palpable energy in the cinema that moved with the story. Tarantino had us hook, line and sinker from the first scene to the last and we left the cinema still buzzing even though we were almost completely emotionally spent. THAT is the mark of a truly excellent film. It strikes every emotional chord in you, keeps you glued to the screen throughout, delivers a satisfying ending and keeps you thinking about it for weeks afterward. 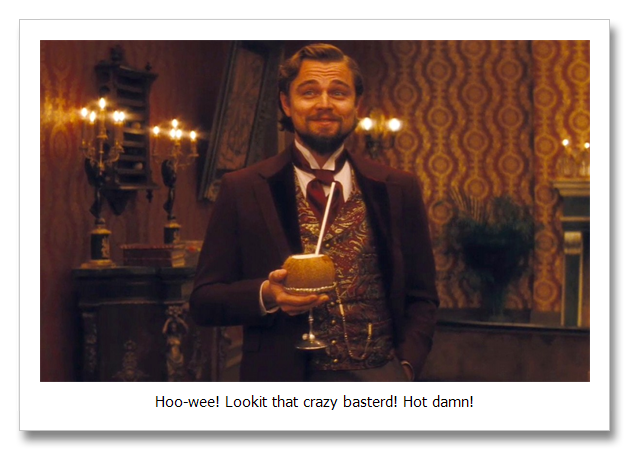 Like almost everyone else I know, I’m a HUGE Tarantino fan and went into Django Unchained with very high expectations. 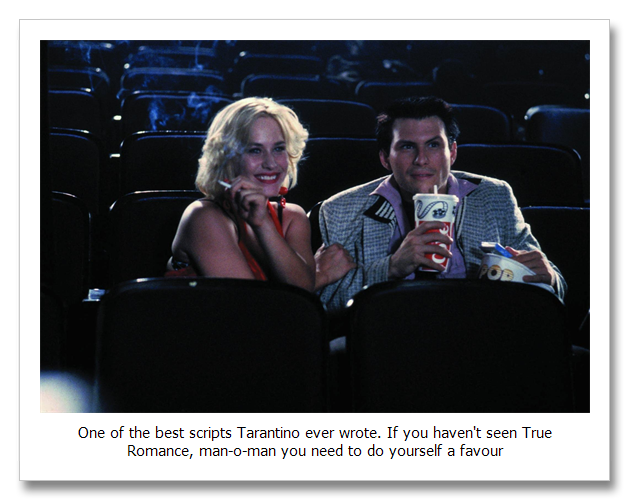 With the possible exception of Jacky Brown and Death Proof I’ve loved every film Tarantino’s written and / OR directed, my favourites being Reservoir Dogs, True Romance, Pulp Fiction (obvious! ), Natural Born Killers (which he co-wrote), Four Rooms, Kill Bill (especially Vol.2) and Inglorious Basterds. Like a true master of his craft, Tarantino seems hell-bent to master every genre of filmmaking and he’s doing a pretty bang-up job so far. He revolutionised the gangster / heist movie with Reservoir Dogs and Pulp Fiction, gave us two unforgettably cool Kung Fu movies in Kill Bill 1 & 2, tried his hand at European-styled filmmaking with Inglorious Basterds and knocked it out of the park and now with Django Unchained he tackles the spaghetti western genre and delivers one of the best films I’ve seen in a very long time. 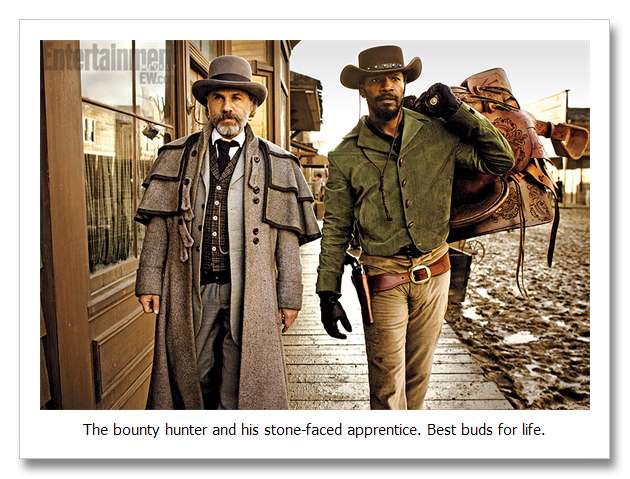 Django Unchained is set in 1858 in the Deep South and follows the story of the film’s titular character Django from when he is freed from slavery by Dr King Schultz (played by Christoph Waltz) a bounty hunter posing as a dentist who is on a mission to track down and kill the Brittle Brothers. Dr. Schultz enlists Django’s help because Django knows what the Brittle Brothers look like as they are the very same people that captured Django and his wife Broomhilda (Kerry Washington) and sold them into slavery. Thus begins an adventure that forges a strong friendship between Django and the good doctor and culminates in the two of them hatching a plan to track down and free Broomhilda from “Candyland” a plantation owned by the maleficent Calvin Candie (Leonardo DiCaprio). It’s a truly epic story and is by far the funniest movie Tarantino’s ever written and directed. 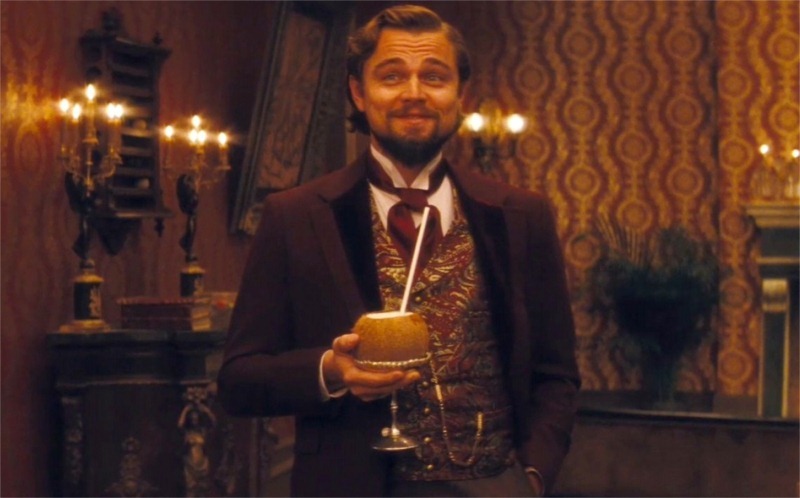 All the best playwrights knew it – humour is the most effective way to make your audience connect with your characters and follow them willingly through the story, and I’d have to say that Tarantino’s use of humour in Django Unchained is one of the films strongest points. Another is the undeniably high standard of acting in the film. 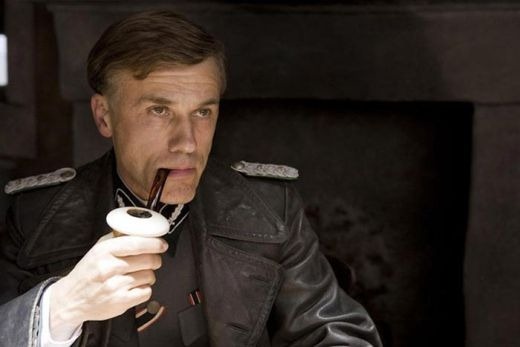 Tarantino has this way of coaxing the best performances out of his actors – he brought Travolta back from the dead, practically made Samuel L. Jackson, turned Uma Thurman into one of the most badass female leads a film’s ever seen and don’t get me started on Christoph Waltz. “Christoph who?” I hear you ask. 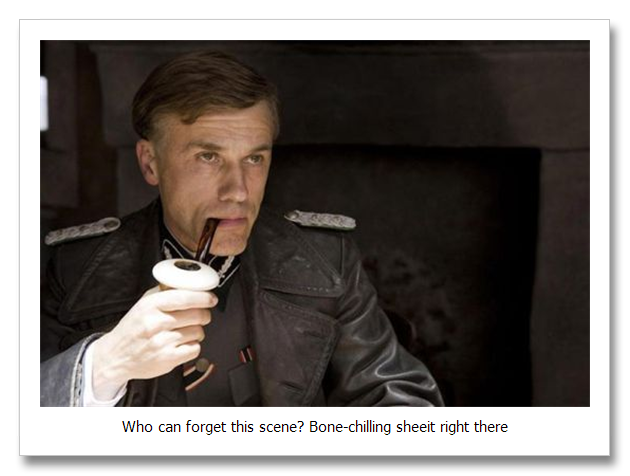 Christoph Waltz – the man who played the “Jew Hunter” Hans Landa in Inglorious Basterds. His portrayal of Dr Schultz in Django Unchained is so riveting that I swear to God, if all he does in his next movie is paint a fence for two hours, I’ll be queuing at the cinema for tickets on the opening night. If he doesn’t get the Oscar for Best Supporting Actor I will hunt down the Academy and take them out one-by-one, bounty-hunter style. Though his performance stands out, that is not to say that the rest of the cast fade like wilted wallflowers in the background. Jamie Foxx, the master himself, brings the tough-as-coffin-nails Django to life and though he’s a man of few words, when he speaks, you listen. 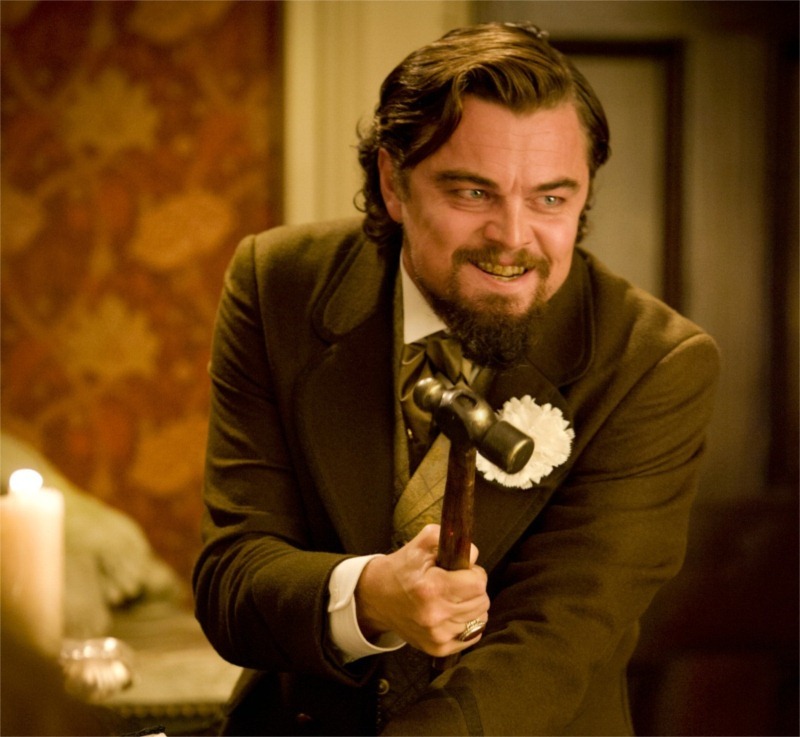 Leonardo DiCaprio shows us a character we’ve never seen him play before and thank God for that. Sure, he’s one of the very best actors in Hollywood but let’s be honest, he honed a certain type of character in The Departed and he’s played the same character type in Blood Diamond, Revolutionary Road, Shutter Island and Inception. He brings something new to the screen as Calvin Candie. A malevolence that is made all the more chilling by his easy charm and charisma. 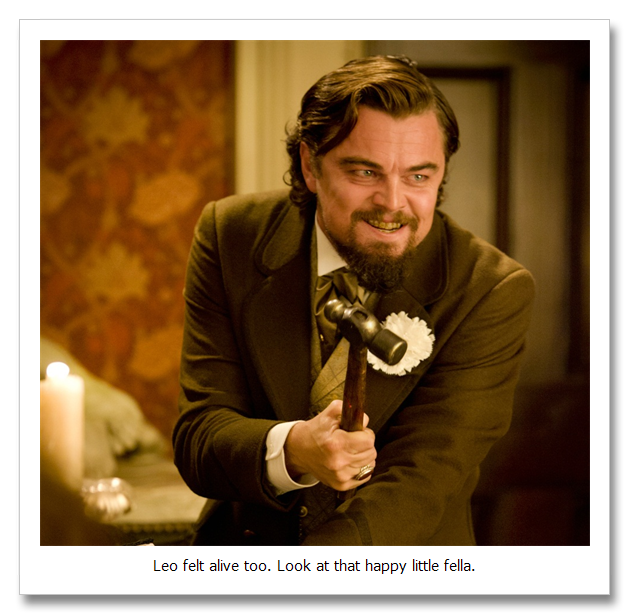 Simply put, DiCaprio looks like he’s finally having fun again in Django. He’s loving every minute of playing the ruthless Calvin Candie and his performance is exceptionally entertaining. Then there’s good ol’ Samuel L. and the less I say about his performance and character the better because I don’t want to ruin anything for you guys. I was NOT expecting the knock-out performance he delivered – the man practically steals every scene he’s in. Again, this is a character Samuel L. has never played before but wow, he does it with so much panache, so much meticulous attention to detail that you’d swear he’s been playing this character for the past 20 years. In a way this review is a little superfluous because you were probably going to see Django Unchained anyway, but if you were umming and ahhing about going to see it at the big screen, you can stop right now. 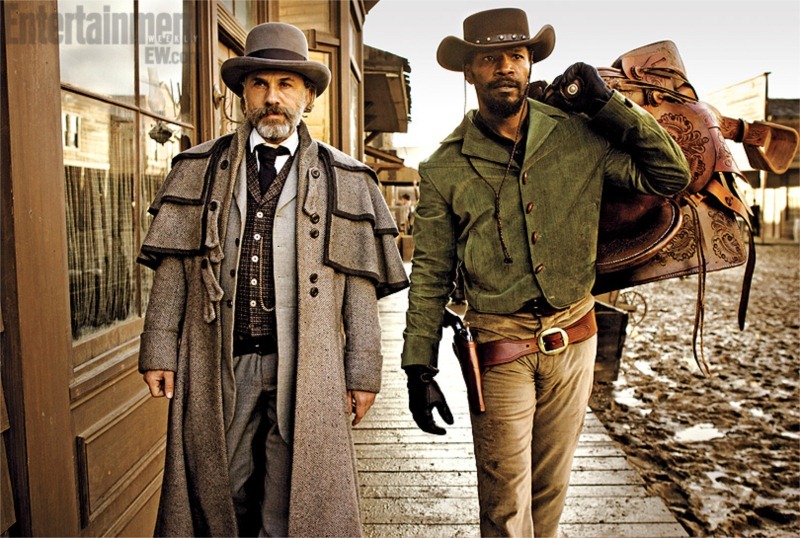 Get to the movies tonight, buy the biggest drink and popcorn you can (it’s a LONG movie), make sure you make a bathroom stop before it starts and go lose yourself completely in the epic tale that is Django Unchained. 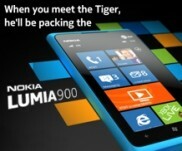 I agree with you 100%. This movie had a lot to live up to and it did it so effortlessly that the 2.5 hours running time flew by with nary a glimpse at the watch. 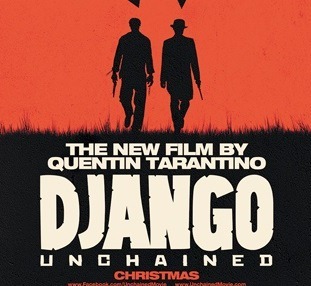 This film again reaffirms Tarantino as one the best (read: best) writer/directors of the past 20 years. The subject matter of slavery is particularly noteworthy as it’s the catalyst for the film’s tension, made palatable by the comical violence and the laugh out loud scenes (who would have thought the early KKK were such a sensitive bunch?). It goes a bit mental in the final act, but that says something about Tarantino’s confidence in his script and well, it just… works. I can’t imagine that Jamie Foxx’s showhorse-play would fit in Amistad, but it sure as hell works perfectly in this film.